The town of Esteli, Nicaragua is known for growing tobacco and making cigars. In fact, many Cuban cigar makers immigrated to Esteli after the Cuban Revolution in 1959. They brought with them their vast knowledge of cigars and the seeds for starting their own farms. The kids and I spent a homeschool morning (I consider agriculture and manufacturing homeschooling) at Tabacalera Santiago where over 120 employees work from 7am to 6pm Monday through Friday in the production of cigars. Surprisingly, it is not expected that employees work on Saturday. Ela and Tag in front of Tabacalera Santiago, one of over 100 cigar factories in Esteli. Most cigar factories are owned by Cuban families. Fields - Summer is the best season for growing tobacco, but growing takes place year-round. It takes about 6 months for a full-cycle of tobacco leaf growth. Once the leaves are cut from the plant, they are taken to a building called "the big house" where they are dried. It takes about 1.5 months for the leaves to change color from green to brown. Once this occurs, the leaves are taken to be fermented. Sometimes chemicals are used in the fields, but not always. The Fermenting Room - Just entering the fermenting room made our eyes sting. The smell was very strong and all of the workers were wearing masks over their mouths. I can only imagine much stronger face protection would be required in the US. The tour noted that is it bad for the health of the workers to be in this room. Tobacco leaves spend 1.5-2 years fermenting. The temperature of the fermenting room is checked throughout the day where it needs to remain between 80-100 degrees Fahrenheit. The leaves are watered and sometimes alcohol is used to quicken the fermenting process. All cigar fillers are fermented. Note the masks on the face of the workers. It's essentially a bandana. This is a man's job in the factory. Factories will use tobacco from different farms. 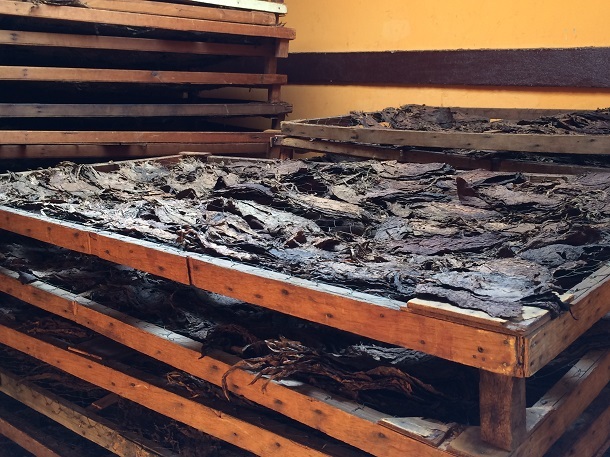 More drying in the Drying Room - After the tobacco leaves are fermented, they must dry again. Leaves are also sorted by size, color and strength. Darker and thicker leaves are stronger. Sometimes an oven is used to boil leaves and give them a darker color. There were several small rooms with racks of drying tobacco. The kids and I were encouraged to feel the tobacco leaves at all stages of the cigar making process. Workers in production phase order their leaves from the Sorting Room. This is a women's job. A Cigar is made of 3 parts: The inside is the filler. A binder is wrapped around the filler to keep it together. Finally, a wrapper is rolled around the cigar to give it a pleasing look. Fillers - Fillers only have the center of the leaf, the vein, removed. Fillers are the best quality leaves that are grown. Wrappers - The wrappers are grown in green houses so they can get bigger. These leaves are not fermented. 1 leaf leads to 2 parts. The vein in the middle of the leaf is removed and, like all other remains of the leaves, is composted. The wrapper is the most expensive part of the cigar because it needs a big leaf. Damaged wrappers become binders. Dried tobacco leaves are sorted by size and color. This is a bundle of tobacco leaves. There are 35 leaves in a bundle. PRODUCTION - Production jobs are the most coveted ones in the factory because they make the most money. During the high season of November and December, more workers are needed in production, which makes a lot of people happy. Production includes the rolling of the cigars. One man and one woman make up a production team. 1. The Man's Job - The man uses simple molds and machines to wrap the binder around the filler. After he has completed 10 of these, he puts them into a box and compresses them for 20 minutes. The men develop an instinct for just the right amount of tobacco filler needed. If they use too much or too little, the cigar won't pass inspection, and then the pair won't get paid for those cigars. Rejected cigars are used as fillers in cheaper cigars. Once the filler is wrapped with a binder, it is pressed in a box for a minimum of 20 minutes. 2. The Woman's Job - The woman wraps the compressed filler and binder in a wrapper. She flattens the wrapping leaf, cuts it to the shape she needs and wraps the whole thing together. Later she clips the end. All left-over pieces are used in cheaper cigars. Binder and filler but no wrapper...getting closer. This machine measures the density of a cigar. Cigars that are packed too tight or have a tight spot will be rejected and the pair that made them will not get paid for it. The rejected cigar will then be used in the makings of cheaper cigars. The smell in this room was strong as well. Groups of cigars are wrapped in newspaper while they age. Completed cigars are aged for 2-3 weeks and sell for $1-2 per cigar. The Boxing Room - Each day, this room produces 400-500 boxes in different shapes and materials. Cigar boxes can be made of plywood or Cedar. Another man's job. This is one of the lowest paying jobs in the factory. The boxes are colored using car paint colors. Words, pictures or symbols are printed onto the boxes using a silk screen process. Packaging Room - This room is full of women working in teams around a table. The first woman places the sticker on the cigar and may place these into a box. Another woman wraps the box. Another woman may add more stickers or labels to the box. This process varies a bit for each table, but the end result is the same. Beautifully packaged boxes of cigars ready for sale. This team of women is paid according to the number of cigars they package. The housekeeper in our Esteli apartment worked in a cigar factory placing stickers on cigars. She held that job for 18 years. Did you know that cigars contain 10-20x times the amount of nicotine than a cigarette? Plus they don't have a filter... Keep that in mind when you smoke your next one. Of course the tour ended with a tasting. Neither kid, nor I, actually took a puff, but they had fun pretending. The smells from the fermenting room were enough for all of us. My apologies for any mistakes here. I took thorough notes at the factory, but the tour wasn't in the order of production. I did my best! I hope you enjoyed it!